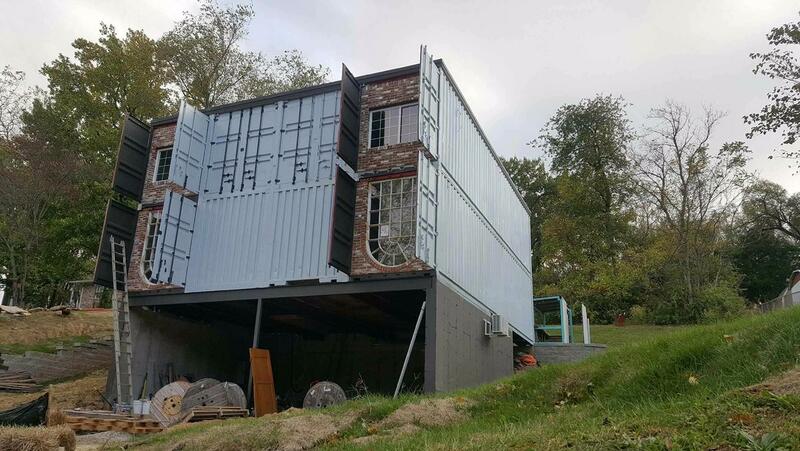 Proposal would regulate St. Charles shipping-container homes. Would it also prevent them? The back of the Smithey's container home with new sod and patio. Click on slideshow to see the front. The front of the Smithey's home, still under construction in St. Charles, is brick with large reclaimed windows. The kitchen and dining room of the Smithey home. A proposed amendment to St. Charles' building codes would make shipping-container homes blend in with more typical houses in the city. A new home on Elm Street sparked the debate that led to the regulations, introduced at Tuesday night’s City Council meeting. The amendment would require shipping-container homes to be fully sided and have a pitched roof. St. Charles City Council member David Beckering said the new rules are not designed to ban such houses. City officials simply want them to be compatible with their neighbors. The proposed changes won’t affect Zack and Brie Smithey’s St. Charles home, made of recycled railroad containers. The Smitheys began construction earlier this year. Now, the front is brick; the other sides are the original steel walls, painted gray. The roof is flat. Putting siding on all exterior surfaces and adding a pitched roof would have increased the cost of the home by up to $50,000, said Zack Smithey, a professional artist and builder. As it was, the entire project — including the land — only cost $125,000. 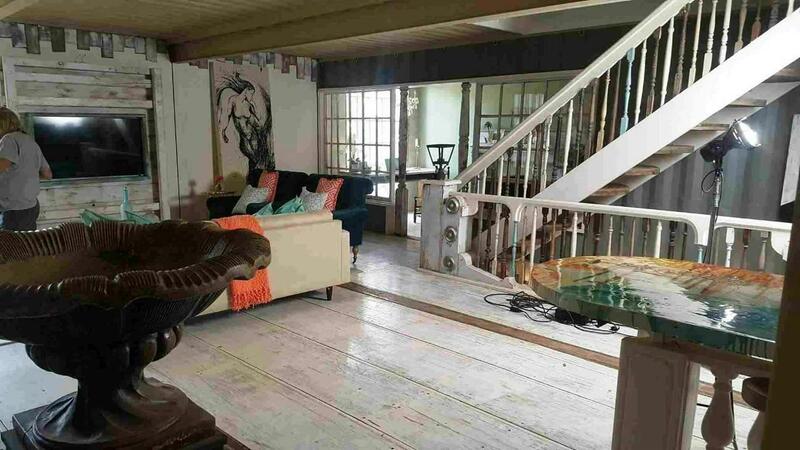 The interior of the Smithey's home, made of eight railroad shipping containers. Zack Smithey said the proposed regulations would have nearly the same effect. 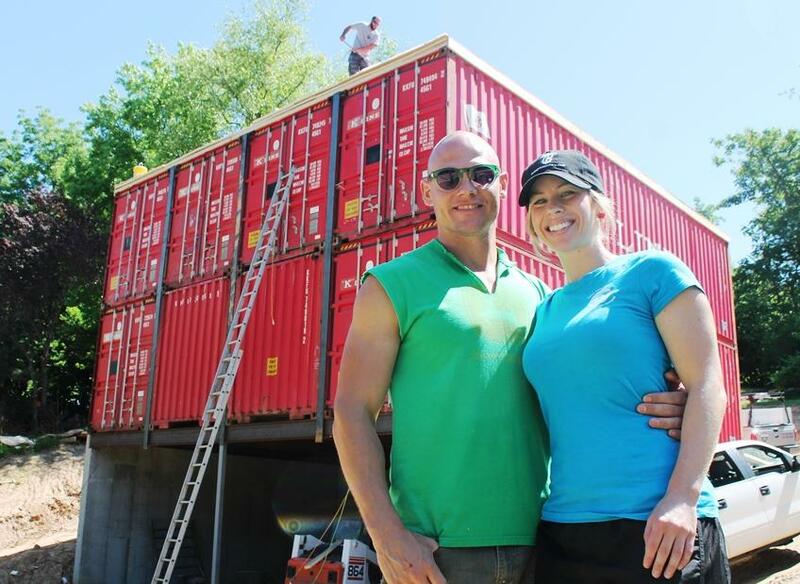 Zack and Brie Smithey in front of their shipping-container home under construction in July 2016. Under the proposed regulations, container homes would be designated as conditional-use buildings. That means each prospective home-builder would have to petition the Planning and Zoning Commission and then the City Council for a permit. 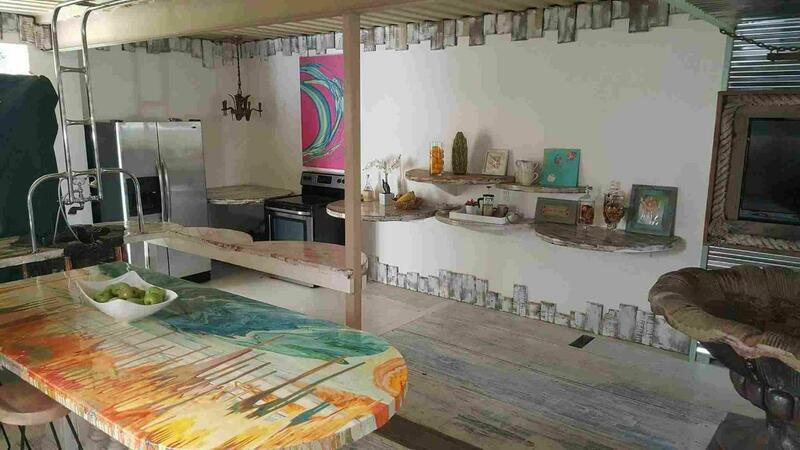 That process takes up to 60 days, and is not required for non-container homes. The public can weigh in at a Planning and Zoning Commission meeting Nov. 21. No regulations would take effect until mid-December at the earliest, according to Beckering. Beckering said he wouldn’t mind seeing more container homes built in St. Charles, as long as they conform to the proposed amendment. “I’ve seen some beautiful ones on the internet; unfortunately [Smithey’s] doesn’t look like that,” Beckering said. 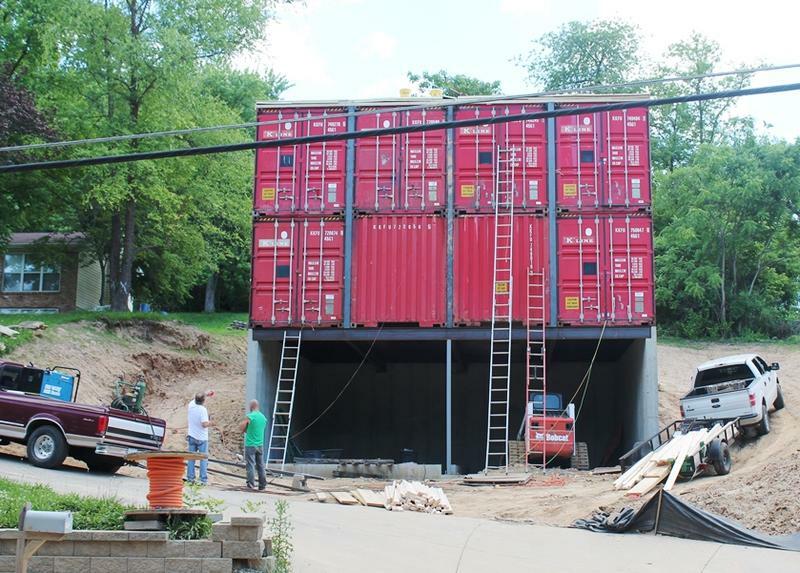 Updated with St. Charles City Council vote July 6, 2016, 12:51pm - An unusual house made of railroad-shipping containers is going up on Elm Street in St. Charles. But if city officials have their way, the nearly-finished place could be the last of its kind in the city’s traditional neighborhoods. St. Charles residents Zack and Brie Smithey began working on their two-story home in May. Their house is being made from eight red containers, doubled stacked and four across. It sits on a sloping lot between a split-level and a ranch. The St. Charles City Council defeated a proposal Tuesday night that would have banned residents from building shipping-container houses in areas with only brick and siding homes. But that's not the end of the controversy. At the center of the flap is a home under construction on Elm Street. 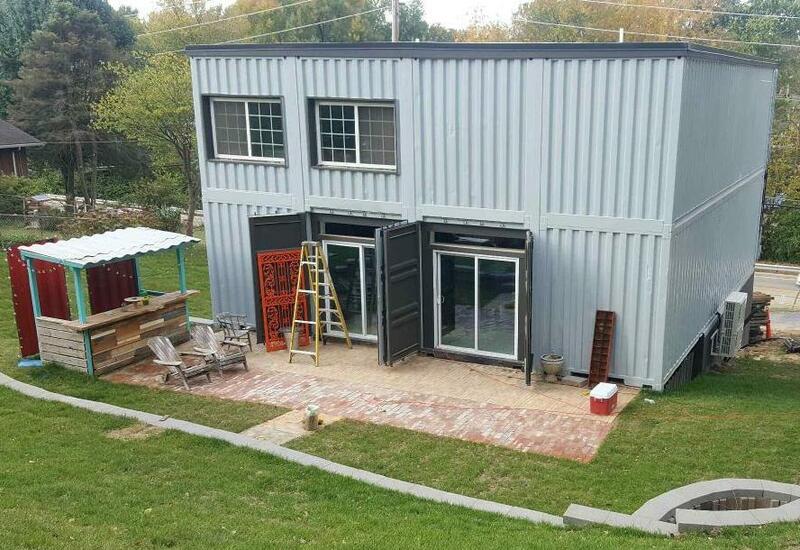 St. Charles residents Zack and Brie Smithey are building their 3,000-square-foot house out of eight railroad shipping containers. 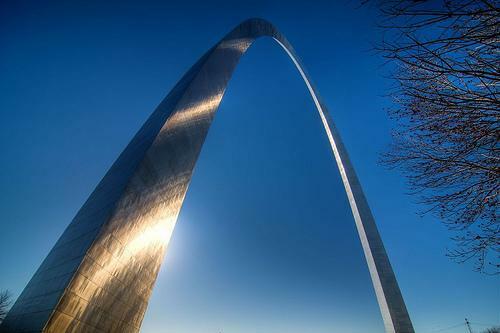 St. Charles County remains the fastest growing county in the St. Louis region, according to U.S. census data released Thursday. New numbers from the 2014 American Community Survey show that the population of St. Charles County has grown by about 5 percent since 2010, from an estimated 361,602 to an estimated 379,493. Demographics analyst and Saint Louis University professor Ness Sandoval points to the county’s relatively low cost of living as the cause of the growth.